An Application to calculate Body Mass Index(BMI). 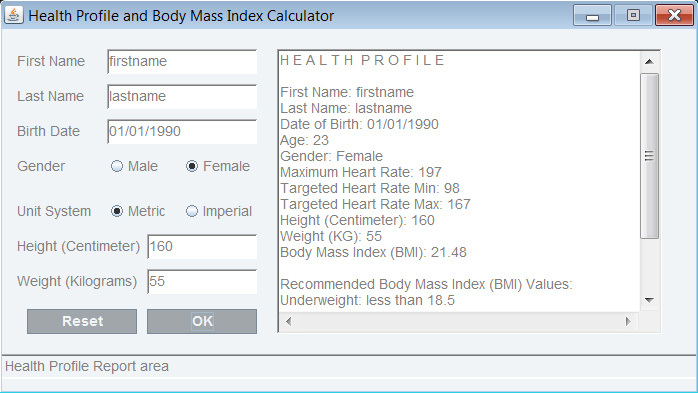 Description: This is a small Java desktop application that takes some information from a user through a swing based Graphical User Interface and calculates user Age, Targeted and Maximum Hearth Rate, and Body Mass Index or BMI. The result will be displayed on a report next to the user entries as you see on the image. The details of Application requirements and formulas used to calculate different measurements are taken from "Java How To Program" Ninth Edition by Deitel different practical exercises. Also I added many requirements to the main problem such as implementing a Graphical User Interface instead of using command prompt and input validation. C:\javacodes> javac FormatUI.java -d c:\javacodes "this statement compiles the class and save it in healthUIPKG package"
C:\javacodes> javac HealthProfile.java -d c:\javacodes "this statement compiles the class and save it in healthPKG package"
C:\javacodes> javac HealthProfileUI.java -d c:\javacodes "this statement compiles the class and save it in healthUIPKG package"
C:\javacodes> javac HealthMain.java "compiles the HealthMain class"
C:\javacodes> Java HealthMain"and this statement runs the Application"
To create the problem requirements I put together following exercises from "Java How to Program" Book. 3.17 (Computerization of Health Records) page 101 A health care issue that has been in the news lately is the computerization of health records. This possibility is being approached cautiously because of sensitive privacy and security concerns, among others. [We address such concerns in later exercises.] Computerizing health records could make it easier for patients to share their health profiles and histories among their various health care professionals. This could improve the quality of health care, help avoid drug conflicts and erroneous drug prescriptions, reduce costs and, in emergencies, could save lives. In this exercise, you'll design a "starter" HealthProfile class for a person. The class attributes should include the person's first name, last name, gender, date of birth (consisting of separate attributes for the month, day and year of birth), height (in inches) and weight (in pounds). Your class should have a constructor that receives this data. For each attribute, provide set and get methods. The class also should include methods that calculate and return the user's age in years, maximum heart rate and target-heart-rate range (see Exercise 3.16), and body mass index (BMI; see Exercise 2.33). 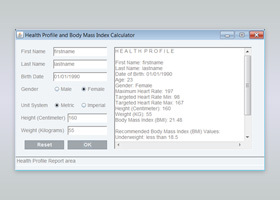 Write a Java application that prompts for the person's information, instantiates an object of class HealthProfile for that person and prints the information from that object including the person's first name, last name, gender, date of birth, height and weight then calculates and prints the person's age in years, BMI, maximum heart rate and target heart rate range. It should also display the BMI values chart from Exercise 2.33. 3.16 (Target-Heart-Rate Calculator) page 101 While exercising, you can use a heart rate monitor to see that your heart rate stays within a safe range suggested by your trainers and doctors. According to the American Heart Association (AHA) (www.americanheart.org/presenter.jhtml?identifier=4736), the formula for calculating your maximum heart rate in beats per minute is 220 minus your age in years. Your target heart rate is a range that's 50-85% of your maximum heart rate. [Note: These formulas are estimates provided by the AHA. Maximum and target heart rates may vary based on the health, fitness and gender of the individual. Always consult a physician or qualified health care professional before beginning or modifying an exercise program.] Create a class called HeartRates. The class attributes should include the person's first name, last name and date of birth (consisting of separate attributes for the month, day and year of birth). Your class should have a constructor that receives this data as parameters. For each attribute provide set and get methods. The class also should include a method that calculates and returns the person's age (in years), a method that calculates and returns the person's maximum heart rate and a method that calculates and returns the person's target heart rate. Write a Java application that prompts for the person's information, instantiates an object of class HeartRates and prints the information from that object including the person's first name, last name and date of birth then calculates and prints the person's age in (years), maximum heart rate and target-heart-rate range. 2.33 (Body Mass Index Calculator) page 69 We introduced the body mass index (BMI) calculator in Exercise 1.10. The formulas for calculating BMI are WeightInPounds x 703 BMI = ----------------------------------------- HeightInInches x heightInInches	Or WeightInKilograms BMI = ------------------------------------------ HeightInMeters x heightInMeters Create a BMI calculator that reads the user's weight in pounds and height in inches (or, if you prefer, the user's weight in kilograms and height in meters), then calculates and displays the user's body mass index. Also, display the following information from the Department of Health and Human Services/National Institutes of Health so the user can evaluate his/her BMI: BMI VALUES Underweight: less than 18.5 Normal: between 18.5 and 24.9 Overweight: between 25 and 29.9 Obese: 30 or greater [Note: In this chapter, you learned to use the int type to represent whole numbers. The BMI calculations when done with int values will both produce whole-number results. In Chapter 3 you'll learn to use the double type to represent numbers with decimal points. When the BMI calculations are performed with doubles, they'll both produce numbers with decimal points these are called "floating-point" numbers.] 1.10 (Test Drive: Body Mass Index Calculator) page 34 By recent estimates, two-thirds of the people in the United States are overweight and about half of those are obese. This causes significant increases in illnesses such as diabetes and heart disease. To determine whether a person is overweight or obese, you can use a measure called the body mass index (BMI). The United States Department of Health and Human Services provides a BMI calculator at www.nhlbisupport.com/bmi/. Use it to calculate your own BMI. An exercise in Chapter 2 will ask you to program your own BMI calculator. To prepare for this, research the formulas for calculating BMI.